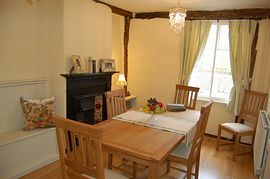 Rose Cottage is a grade 2 listed building in the centre of Debenham, one of Suffolks prettiest villages. 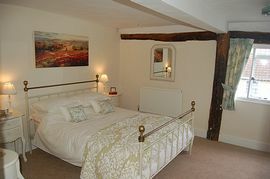 The cottage is very well equipped and maintained to the highest standard. It sleeps 4 in 3 bedrooms on the 1st floor. The cottage offers living room, dining room, kitchen, bathroom and 3 bedrooms. The kitchen is fully equipped with dishwasher (tablets provided) oven, hob, microwave-grill, fridge freezer, blender and all the equipment and utensils you will need. The washer-dryer is located in the understairs cupboard. In the living room you will find a TV;DVD with freeview, ipod dock-radio, or relax on the leather sofa or Laura Ashley chairs with a good book, and admire the beamed walls and ceilings and inglenook fireplace. In the diningroom you will be able to enjoy your meal on the large oak dining table and chairs, or sit back on the leather sofa and play with the PS2 on the TV;DVD provided. The bathroom is clean and bright, with bath and shower over, with glass screen, basin and WC. Upstairs the master bedroom has a king size bed, TV;DVD and hairdryer. The other 2 bedrooms have single beds. A cot can be requested free of charge and can be placed in either the master bedroom or 2nd bedroom. We will also provide a highchair and stairgates for the top and bottom of the stairs. All towels and linen are provided. Heating and electricity is also included. 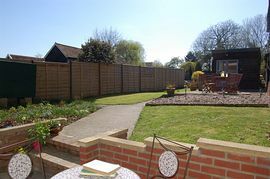 Outside there is a large sheltered garden with 2 sets of garden funiture, patio with barbecue, gardens and a lawned area. Debenham village offers all you need to enjoy your stay, if you want to avoid any large towns! There are cafes, 2 pubs (one with restaurant) local shops and galleries and plenty to do and see nearby. Framlingham Castle is only a short drive away, and only 45 minutes drive is Suffolks heritage coast with Aldeburgh, Southwold and Thorpeness. Inland are the attractive towns of Framlingham, Lavenham and Bury St Edmends. Or simply enjoy the unspoilt Suffolk countryside with and all the small villages and endless attractions. Rose Cottage offers the perfect base to explore and enjoy all that Suffolk has to offer, for that perfect Suffolk Cottage holiday. Central village location, walking distance to all local shops, etc. Please don't smoke in the house. The garden is fine. Good sized garden with lawn and patio. 2 sets of patio furniture and barbecue. Local Services: Debenham offers a selection of local shops, cafes and pubs. 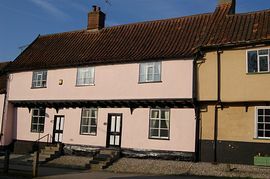 Rose Cottage is located in the centre of Debenham. Full travel directions will be provided in the information provided before you travel. Low season: Full week £320.00, short break £240.00. Mid season: Full week £380.00, short break £285.00. 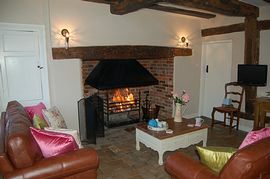 Rose Cottage is available all year for full weeks, weekends and midweek breaks. Change over day for full weeks is on Friday. Weekend breaks are from Friday to Monday. Midweek breaks run from Tuesday to Friday. Arrival time is from 3pm, departure by 10am please.